Saints Cyril & Methodius are the founders of the Macedonian, and also of the Slavic literacy and culture. Saints Cyril & Methodius created the first Slavic alphabet, translated the first books on Slavic language, and by the spreading of the Christian religion in the churches in Slavic language, they have had hit the bases of the Macedonian, and the Slavic culture. By that, they gave to the Slavs the strongest weapons in their battle against the Germans and the Greeks, who wanted spiritually, to destroy the Slavs. Beside that, Saints Cyril & Methodius are the first Slavic writers. The brothers Constantine (Cyril or Kiril) and Michail (Methodius) were both born in Solun (Salonica, on the Aegean coast). When they were born, this great ancient Macedonian city was completely Slovenized under the influence of it's clearly Slavic surroundings. 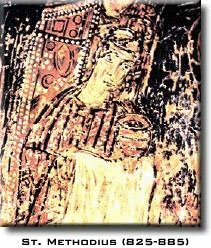 That fact was also mentioned by the Byzantine emperor Michail 3rd (842-867), when he responded positively to the letter of the Moravian comes Rostislav and sent Constantine and Methodius in the mission in Velika Moravija. This two brothers were from a very rich and well known family all over the region of Solun (Salonica). Their parents were Lav and Maria. Their father Lav was major commandant of the Byzantine navy forces of Solun. The older brother Michail, got the name Methodius after the became a monarch and was born in 825. 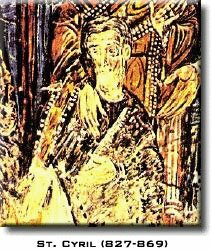 Methodius as the Byzantium tradition should have followed the life of his father. So he went to a military school, where the students should learn about military activities. He was very brave and physically good built. After the school as a young warrior he was sent to rule over a Slavic Sclavinia, located in the Strumica-Bregalnica region. Methodius ruled the region for 10 years, from 845 to 855 and he had a mission to get the Slavs who lived there on Byzantium side against the battle with the Tataro-Bulgarians. But that was very hard because of the low moral, no discipline of the Slavic soldiers, such as the weak motivation of them to go in a battle for the Byzantium interests. So Methodius to get rid of their undisciplined characters, invented the "Law for judging the people", written on Slavic language with Greek letters. But soon this region was conquered by the Bulgarian (Tataro-Mongols) comes Boris. The younger brother Constantine, got the name Cyril after the became a monarch and was born in 827. He didn't follow the steps of his father, and as young he got interested in the subjects at school and in reading which helped him to became one of the most smart people in his epoch. His parents helped the talented Cyril, to go in a school together with the other children from rich and known families from Solun. But beside them who spent their free time for fun, Cyril has all his time spent in studying and he had the best knowledge of all of them. Even he was 7 years old, he got interested in the philosophical science. In learning this science he was helped from his several languages knowledge. He knew to speak Greek, as an official in the schools, Cyril also knew to speak Jewish. The last year of his school in Solun it was filled with sadness because the death of his father, Lav in 841. As he was approaching in the 15th year of his life, he went to study in the Constantinople (Carigrad, Istanbul) in the famous Magnauric School, which school raised into a university. At here Cyril meet with geometric, astronomy, arithmetic, music, philosophy, mathematics, grammar and other subject and sciences and got met with a famous people like, Lav Mathematics and Photius. Here Cyril learned the Latin and Sirian language. After he finished the school in 847, he was kept in Carigrad to work. He became a librarian in the Patriarcharte of Carigrad and a secretary of the patriarch. 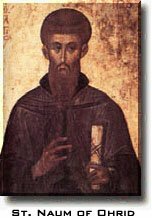 But in the same 847 year, Cyril quit the work, and went in a monastery near Carigrad. Soon he started to work as a professor in the Magnauric University of Carigrad and became a popular person not only in at the students, but at the high educated people. As a popular person he got the epithet Philosopher. As a popular and people with extremely large knowledge, the brothers Cyril and Methodius were sent in a several missions. The first mission was the mission of Bregalnica, where Saints Cyril & Methodius had created the Slavic alphabet, the Glagolithic, containing 38 letters. Soon a lot of books were written on Slavic language and around 54.000 Slavs were converted into a Christians. So, Cyril and Methodius invented the bases of the Slavic literacy and culture in Macedonia. That's why Macedonia is called the fatherland of the Slavic literacy and culture. After 855, Saints Cyril & Methodius together with their students and followers left Macedonia and went to Olimp, a mountain in Asia Minor. The second mission was the mission at the Saracens (Arabians) in Bagdad. It started in 855 and finished in 856. At this mission was sent only Cyril, who visited Bagdad. This mission was a diplomatic: to exchange prisoners and protection of the Christians who lived in the borders of Arabia. The third mission was the Hazar. The both brothers were sent and on the way to the Hazars who lived by the Black Sea, Saints Cyril & Methodius stopped in the city Herson, where Cyril found the bones of the Roman Pope Clement, who was proclaimed as a saint. After the successful mission they went back Carigrad in 861. "With the mercy of god we are healthy, and we've been visited by a lot of teachers - Christians from the Vlachs, Greeks, Nems... studying us differently. And we the Slavs, we are simple people, who need someone who can tell the truth and explain. Please good master sent us that MAN, who will explain that to us." There was no hard work for this mission. Everything what Saints Cyril & Methodius were of a need of was finished: they created the first Slavic alphabet - the Glagolithic alphabet; translated the first churchly service books on Slavic language and in the year of 863 AD, came in Moravia. The brothers St. Cyril and Methodius, together with their students were welcomed in Moravia by the comes Rostislav and from all over Slavs. For a short period were hit the bases of the Slavic literacy: a lot of schools and churches were opened, in which the Christianity was spread. But the German-Latin priest were not satisfied with this loose. Saints Cyril & Methodius went in Rome at the Pope, and lied that St. Cyril and Methodius spreads a heresy, not the Christianity. So the Roman Pope called the both brothers in Rome to check that. On the way to Rome, St. Cyril and Methodius stopped at the Panonian Comes Kocelj. After they established the bases of the Slavic literacy here they went in Venice, where St. Cyril as a real philosopher and spokesman, has defeated the charges of the triple-languages people, who thought that the Christianity has to be spread by Latin, Greek and Jewish language, because the other languages haven't been given from god. After the stay in Venice, St. Cyril and Methodius, joined by their students (between the students were St. Clement of Ohrid and St. Naum of Ohrid) came in Rome. They were welcomed by the Roman Papa Adrian. When they arrived there St. Cyril has showed a deep sense of diplomacy, he brought the monk clothe of the roman Papa St. Clement who was tortured and killed in the sea in 100 AD and who later was proclaimed as a Saint. In 869 a couple of events of a destiny contents for the Slavic people. First the Roman Papa Adrian has accepted the Slavic books which means that the Roman church has officially accepted the Slavic literacy. But soon after this meeting St. Cyril got ill and died soon. He was buried in the church St. Clement in Rome. St. Methodius with his students got back in Panonia and moved on the work. In 871 AD, there was an attack made on St. Methodius and his students. Reason for the attack was historical-church-low battle. St. Methodius and his students were at hard condition. St. Methodius was taken to prison somewhere in Bavaria couple of times repeatedly, but in other prisons. Their students were in hard condition also. After a short period St. Methodius died in 885 AD.